I’ve been away from the blog for a bit, not because I haven’t been riding my bike, but because I’ve been writing so much for other things, and it turns out there are only so many words in me. And then I was in Boise for a week, sans bicycle, and then right back in Baltimore and back to work. And then there was Thursday, and I got to ride my bike all over, first up to Roland Park. I took Keswick this time, and enjoyed the interval training of its rolling hills. And then it was back down the hill, a couple of stops, and then the new casino and its massive collection of bike racks right by the valet parking. How can this be that they actually built in room for several dozen bicycles? At the casino??? My friend A. says it’s so people who lose their car titles at the tables can still come and blow through the rest of their wad, but I never bring more than I can afford to lose, and I’m happy to have a place to put my bike that’s not a street sign. Listen, I know casinos prey on the poor and the addicted. The idea that we could or should fund our communities and schools with money gathered this way–well, that’s a terrible idea, and it might even be immoral. And yet, here I am again, a few $20 bills from today’s payday, ready to zone out pushing buttons on the penny slots. That repetitive action and the flashing lights create one of the few situations where my mind stops spinning and thinking and racing around. I’m just staring at the screen, pushing buttons. They say it works on the same part of your brain as cocaine, and it’s been a long, long, long time since that was a choice for me, and I think gambling’s safer anyway. Most people I know refuse to gamble because it’s like throwing away money. You’ll get no argument against that from me–it’s totally throwing money away. Except that it doesn’t take long for the money to cease to be money and become game tokens for me. A 50 cent bet doesn’t feel like it costs 50 cents. It feels like it is one bet of 40 out of the $20 gaming piece I brought in with me. That’s why I can’t bring in more than two–or maybe three–of those. Today I lost $40, but it took me two and a half hours to do that, and in the world of gambling, that’s a huge win. 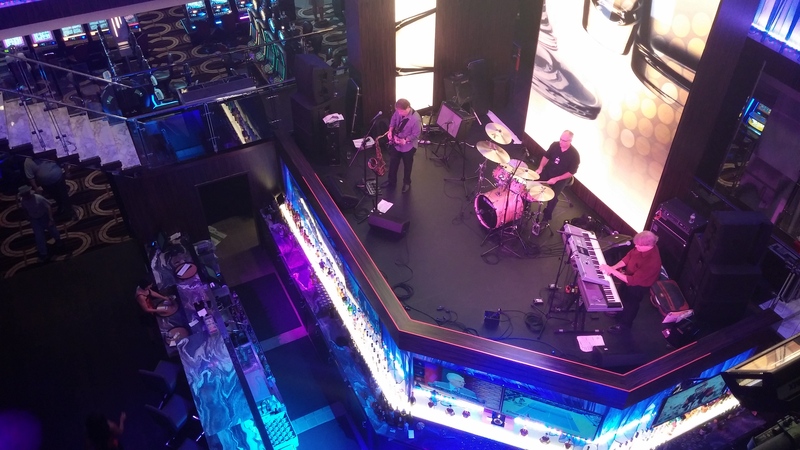 I spent a little time watching the succession of bands playing the greatest hits of yesterday and today to pretty much no one from atop a bar that was serving just a few drinks. And then it was time to ride my bike back up the hill to home. I left to the sounds of a band playing outside to no one, drink and food stands with no one to serve, and traffic cops with no cars to direct. I had the overwhelming sense that a party had been thrown but the guests decided not to show up. Maybe the crowds gathered later in the evening, but I’m happy to let that be my first and last visit to the casino down the hill for a very, very long time. Something tells me I’ll be more help to the schools by volunteering with the Waverly Elementary family reading program than tossing my game tokens into the slots. This entry was posted in food and drink, schools and tagged Baltimore, casinos, Horseshoe, Roland Park. Bookmark the permalink. That’s why I love casinos because they stop the racing of my mind too. For many folks, finding a good time is difficult. Glad to see that’s not the case with you. And with insight, no less. You surely were raised well.